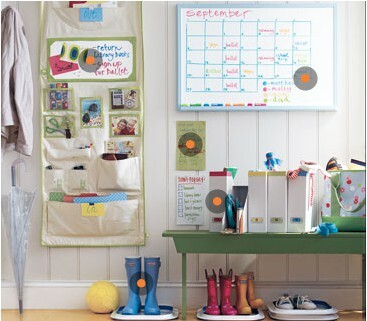 A Few Tips on how to make your homeschooling day more organized. The Right Tools + Routine + Self Discipline to keep things neat = Organization! Use a shoe organizer on your closet door for school or craft supplies – great because it holds a lot of items, makes use of a space that would normally not be in use AND the pockets are clear so kids can see exactly where everything is. Put ‘teacher supplies’ up high out of reach of younger children. 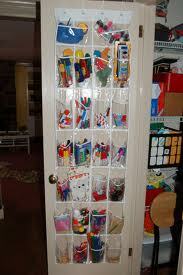 Another ‘door organizer’ used on the wall to maximize storage space. Label the different pouches to help with organization or have a different door organizer for each child to keep everything separate and in it proper spot. 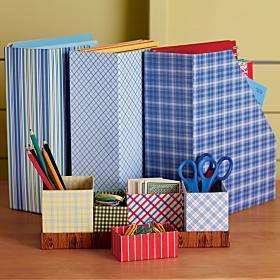 Place all of your child’s daily workbooks/curriculum in a magazine holder on their desk. Label it with their name. Place the books/worksheets in the order which they should complete them in. Have a Daily Goal Chart for each child. They will write how many pages they will do in each subject each day and will be able to cross off their goals once completed each day. You can help your child modify their schedule as certain subjects get more difficult/easy for them (i.e. the number of pages they do each day for each subject will reflect the level that they are working at in each area). Keep a Portfolio for each child. A Binder in which you place all of their exemplary work, large projects and tests. Place dividers in the book for each section you wish to have in their portfolio. This way all of their tests are in one place, all of their art is in one place, all of their exemplary work is in one place etc. 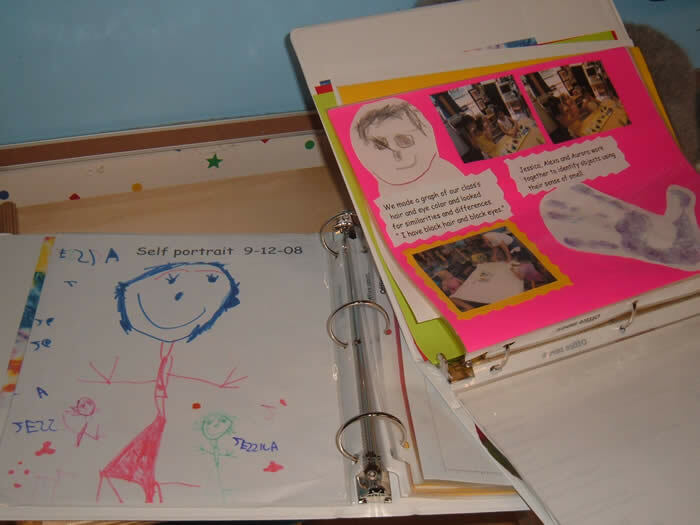 Portfolios are a great organization tool but are ALSO a source of pride for a child and helps them monitor their progress as well. Let your kids personalize/make their own pencil/supply holder. This will keep all of their desk items in one place and it will teach them to be responsible for what is theirs. Store your curriculum/supplies by grade in plastic bins. For parents with multiple children this is a great way to story everything as each new school year they will have access to the all of the grades that they need and they won’t have to reorganize each year. Put a shelf in the closet to maximize storage space. 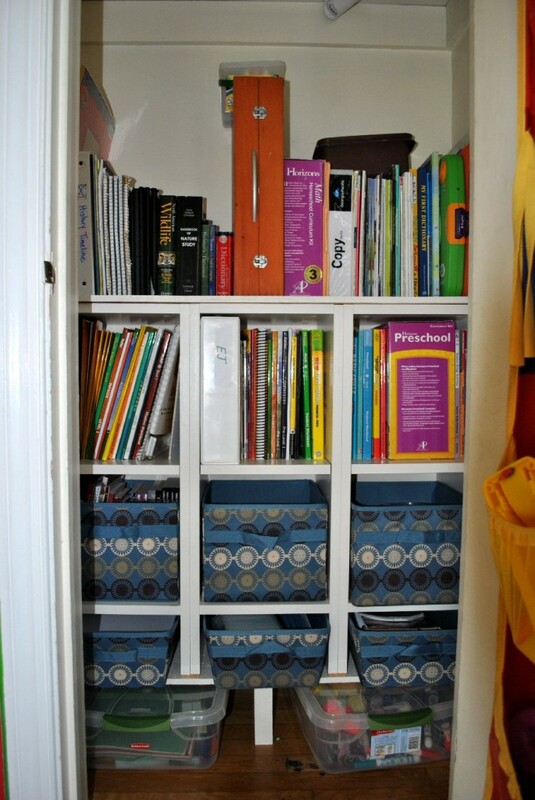 Use decorative bins to store loose items or books/curriculum that you don’t use on an everyday basis. ← How Will I Educate My Children?